Scholarship presentations will be made at the respective schools award ceremony. The Scholarship Program is funded by FOR San Bernard through their fund raising events. Thank you for your continued support. The FOR San Bernard Watershed Scholarship Program is pleased to announce the winners of the 2014 Scholarship Program. Six $1000 scholarships were awarded to seniors graduating from high schools within the San Bernard Watershed (Bellville, Boling, Brazos, Brazosport, Columbia, Columbus, East Bernard, El Campo, Lamar Consolidated, Needville, Rice, Sealy, Sweeny, and Wharton. Over twenty applications were received this year. Students must live in or attend a high school whose district is within the San Bernard watershed and demonstrate a direct connection between their career path and the betterment of the environment. 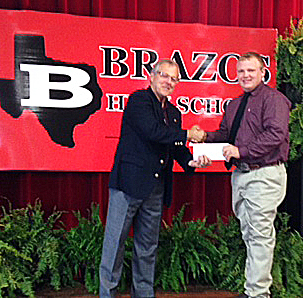 FOR President Wayne Head presents a $1,000 San Bernard Watershed Scholarship to Cameron Tiemann at the May 19 scholarship presentation at Brazos High School. presents a a $1,000 San Bernard Watershed Scholarship to Leanna Castaneda at the May 29 scholarship presentation at Needville High School. Kaitlyn Braddock is ranked 2nd in her Columbia High School graduating class with a 103.657 GPA. She will be attending Texas Tech University’s honors program to major in Biology with a minor in Spanish. She hopes to specialize in field research closely related to animals or zoology. Kaitlyn’s desire for her future is to have a direct impact on environmental improvement while being a well-educated student and also a wife and mother. This makes her a perfect fit for the San Bernard Watershed Scholarship. She is a member of the National Honor Society, serving as Historian. Volunteer activities include Sea Center Texas, SPCA, Brazosport Art League, PALS (Peer Assisted Leadership) and CIS (Communities in Schools). Cameron Tiemann is a graduate of Brazos High School. He is ranked 3rd in his class with a GPA of 95.98. He plans to attend Blinn Junior College to receive his basics and complete some Agriculture course work needed for his Degree in Agriculture Science. He intends to major in Animal Science at Texas A&M with a minor in Agricultural Systems Management. He is a member of the National Honor Society, serving as Treasurer; He has served as Vice President and Sentinel of Brazos High School’s FFA and Fort Bend County 4-H Club President, Vice President & County Council. Mark Stanford is a graduate of Columbia High School. He will attend Texas A&M at Galveston in the Maritime Administration program to receive a Bachelor of Science degree. Mark is a member of the National Honor Society. He has attained the honor of an Eagle Scout and has participated in many volunteer projects in Scouting, at the Brazosport Planetarium, and at a local summer program Feed My Lambs. Having spent many hours on the San Bernard river has deepened His Love of the outdoors and fostered the respect he has for the environment demonstrating his understanding and appreciation of the goals the Friends of the River wish to convey. He is a member of the United Methodist Church and demonstrates his leadership abilities in various volunteer and community events. Billye Mills-Jones graduates from Sweeny High School with a GPA of 98.454. She is a National Honor Society member and was elected two years as vice-president of her class. She is a highly motivated volunteer giving her service to projects for orphans in Ghana, building repairs for under-privileged senior citizens, ringing the season’s bell for the Salvation Army and raising monies for Brazoria County’s Youth Home. She has witnessed our states government by being an Honorary Page in the State Capital on three occasions. Billye is not only a talented musician, but athlete as well. She has a way of motivating others to attain their goals. Her intentions are to follow a career in Nursing at Stephen F. Austin State University to obtain a Master of Science degree. Her achievements, along with her desire to raise awareness of health and how that affects our environment make The San Bernard Watershed Scholarship program proud to announce her as recipient of this scholarship. Shelby Moody is a graduate of Sweeny High School. She graduates with a grade point average of 97.491 she is a member of the National Honor Society, Phi Theta Kappa, and Powerset an organization designed to prepare students for the modern world of work. As a member of the S.I.S.D. band for seven years Shelby successfully directed the Sweeny High School Marching band as Drum Major her Junior and Senior year. She volunteered over 300 hours with various community and school organizations. The First United Methodist Church, Adopt a Beach program and Sweeny United , a program that assist elderly and less fortunate in the community with home based construction and chores are just to list a few. She intends to receive a degree in nursing from Texas A&M University-Corpus Christi . Her hope is to instill a greener more earth friendly attitude in our society through the lives of those she will influence with her career and her life. Leanna Castaneda graduates from Needville High School with a GPA of 99.028. She will be attending Texas A&M University at College Station to major in Architecture with a minor in Landscape and Environmental Design. She hopes to have a career where she can focus on the revitalization of cities and parks while conserving the natural environment of our land and waterways. She has volunteered numerous hours for community organizations and benefits for those in need. As an artist and athlete Leanna’s leadership skills exhibit traits that will enable her to succeed in life. 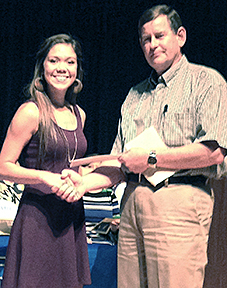 Finding Leanna Castaneda a worthy recipient the San Bernard River Scholarship is proudly awarded to her.